If you are a honeypot collector – you have found the hidden treasure! We are experts in the field of antique, rare honeypots and delighted to be able to list a select few for sale. Did you know we founded the United Kingdom Honeypot Collectors Society (UKHCS) in the early 1990s and have a personal honeypot collection of over 700+. Yes we are a bit honeypot obsessed! Here are some we found that we hope will delight you. You must call the shop on 020 79246233 to confirm BEFORE ordering any of the items listed within Antique Rare Honeypots. These are rare one off finds. Therefore to avoid disappointment-call first to see if the item is still available. Real English Pub Beer Pull Handle. This is used in British pubs to pull a pint!. 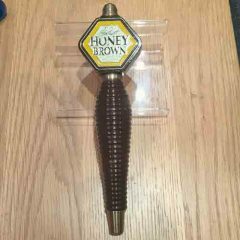 We loved it because it featured a metal skep beehive at the top and says ‘ John Lambott Honey Brown Lager’. This is from our private BEE collection. Its very heavy, made of metal and wood. It has a female screw head at the base so it can be attached to any male thread on the base tab at pubs. Great condition and a great addition to any beekeepers collection of bee artefacts. Used, sold as seen. This is from our private BEE collection. 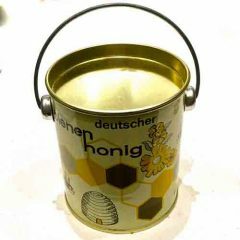 This is a vintage honey tin, German origin with wire handle and lid. There is writing and artwork surrounding the tin. Great condition and a great addition to any beekeepers collection of bee artefacts. Used, sold as seen. This is from our private bee collection. This is a rare vintage pull toy that I remember playing with many years ago. 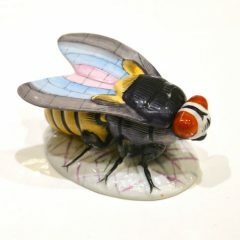 In very good condition, has original plastic pull cord and Queen bee made of wood. Her crown is plastic. As you pull it the wings turn. Great collectors piece and a fab gift for any newborn. One only. A wonderful 3 piece set. 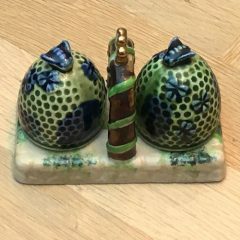 Comprises of beehive shaped Salt shaker, beehive shaped Pepper Shaker and stand that holds them. Vintage and rare. Made by the renown pottery firm Marutomoware. Fully base back stamped with Japanese writing. Good condition no cracks, damage, repairs. Golden brown honeycomb (section) dish. Made in USA. Very rare. Wonder detailed embossed glass. This pressed glass or Vasoline glass as it was referred to has embossed hexagon comb cells and bees design to the base and lid. Vintage collectable in very good condition. These are rare old one off pieces. Skep shape, Red roof honeypot. Vintage and rare. Made by the renown pottery firm Marutomoware. Fully base back stamp with Japanese writing as well. Good condition no cracks, damage, repairs. Shows inner aged honey stains. Outer of course show signs of natural wear due to 87 years of life like us all! This honeypot is in the shape of a skep beehive and the lid has straw depicting what would have been used to protect the hive from the elements. It has an incorporated stand to the base. This pressed glass or Vasoline glass as it was referred to has embossed basket weave and bees design to the base and lid. Made in USA. Vintage collectable in good condition. These are rare old one off pieces. This is from the Hamill Honeypot Collection. In great condition and from a top Irish pottery maker. Is has the traditional shamrock design noted as the trademark signature of Belleek. Very fine porcelain. Circa 1970s, base mark. Amazing piece! All hand painted in tiny detail. The wing lid comes away to reveal the hidden hollow in the base for trinkets. Very geometric hand painted pattern to the wings. Never seen this in the 40 years of collecting bee items. Time to go to a new home to enjoy! Base still has an vintage label, written on it, ‘Pirkenhammer;. Embossed is F&M. There is no base stamp, only the embossed letters. 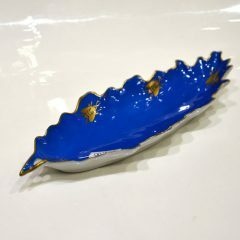 Hand painted Belvedere Limoges Oak Leaf Bee Dish. Cobalt blue with gold bees and trim. Last one. Reduced to clear. 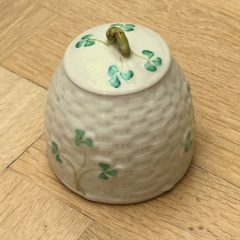 From the famous German porcelain makers Goebel comes this little gem of a honeypot. Shaped like a honeybee, the wings act as the lid and can be removed to access the honey within. Very collectable sought after piece. Condition. : Perfect accept for a tiny minor chip to the rim of the base. Therefore we have substantially reduced the price. Have a look at the images 2-3 as we have taken close up photos so you can see the chip before buying.